Anaheim is known for its great attractions and wonderful weather, two of the many reasons people love to call Anaheim home. The Southern Californian residents are fortunate enough to have warm weather for the majority of the year, but we also have our very hot days. Just like anyone else, Anaheim residents fight back against the scorching weather by blasting their air conditioners. But one negative factor that comes with using air conditioning…. costly power bills. But an outdated air conditioner can cost more than just money, as it also can pollute the air that your family is breathing. of 13. You can see the SEER rating for your unit by looking at the Energy Guide sticker on your air conditioning unit. It is not uncommon for an older air conditioner to have a SEER in the single digits. You will see that it would not take long for a new air conditioner to pay for itself just through the vastly reduced energy consumption. And, you can even buy an air conditioner with a SEER over 20 for maximum efficiency! Although a new air conditioner can be a big investment, so can the costs of continuing to repair and operate an old, inefficient unit. Energy Star recommends upgrading to an energy-efficient unit if your current central air conditioner is 10 or more years old. Have you noticed a big decrease in the amount of air that certain rooms in your home are receiving? Or maybe you are not receiving air at all in your upstairs rooms? Both of these problems can occur because the air conditioner may be on its last few days. But these also can be an effect of a buildup in your air vents. 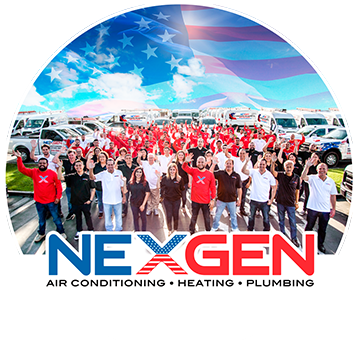 The best possible solution would be to contact your local experts at Nexgen Air Conditioning, Heating and Plumbing. We will make sure to lay down your options for whatever the issue may be, trust the job to our Trane-certified HVAC technicians. Repair costs aren’t the only factor that should be weighed when deciding between repairing once again or finally making the jump to that new air conditioner. New air conditioners will also improve airflow in your home, and a new system can also do a better job controlling dirt, pollen, dander, and other debris that can cause allergies as well as other health problems. One tell-all sign is that of an increased power bill! This is because your air conditioner will have to work much harder to produce the same amount of air it normally would. Normally it would take 25 minutes to cool down your home but now it takes almost an hour and a half… this will most definitely cause your bill to skyrocket! Upgrade to new equipment, and you can reduce your bills for years to come. A HUGE warning sign for your unit’s effectiveness and efficiency is an increase in your power bill cost & this is usually the biggest factor that pushes people over the edge. Have you noticed that your home fluctuates in temperature pretty frequently? Does it take a while to get your home up to proper temperature? These are two of many signs that your air conditioner may be needing a replacement. From low Freon levels to a broken compressor, any number of issues could be a factor. This also could be a sign that your air conditioner may be outdated and not have enough power to cool the entire house. Sometimes an air conditioner is improperly fit when originally selected for the home, this can cause an issue with cooling down certain rooms. Occasionally the final straw pushing a homeowner over the edge is the high cost of a big repair that may be needed. When this does happen it is best to weigh the advantages of moving to a new air conditioning unit versus paying for a repair. Sometimes it may be smarter to move on! Replacing your air conditioner is a big investment for your home, but wasting money on repairs won’t solve any long-term problems that an old unit has. You will not regret investing in a new piece of equipment, your home will finally feel comfortable on those hot summer nights and your power bill will see a drop in price. But don’t let the high costs of investing in a new unit scare you away! Depending on the type of unit installed, a tax rebate can cover up to 30 percent of the cost of a new HVAC system. Also, check with your utility company if they offer any rebates and incentive programs for energy-efficient heating and cooling systems.